The second time we were there, we chose to tour Dominica Island with Levi after I read reviews about him on cruise critic. This photo was taken in November 2008 when we visited the island for the 3rd time and he took us snorkeling at Champagne Reef. When I emailed him my questions, he was very prompt in getting back to me and true to his promises. Yes he would personnally be our guide. He told me he doesn't take more than 10 people at a time... I like that, more personalized. His bus is a small one (16 seater) and was very clean. He was also a very good driver! All I had to do to book the tour, was send him an email telling him when we'd arrive and how many people we were. He would then send me an email 2 weeks before we arrive to tell us where we would meet him. We paid after the tour. 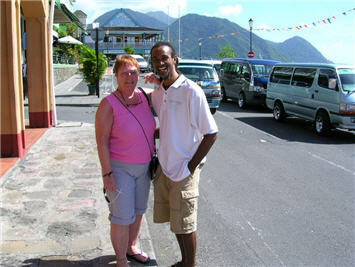 Levi offered many tours that you can choose from and I asked if we could combine TiTou Gorge and Trafalgar Falls. He said sure, no problem at all. On the same tour, we also saw the fresh water lake located in the Morne Trois Pitons National Park. On the way we drove up to Morne Bruce, a viewing point, and then to Botanical Gardens. We had a fantastic time touring Dominica island with Levi. Should you visit this gorgeous Nature Island during one of your cruises, make sure to contact Levi. You won't regret it.